Here is what the river looked like last week, when I was standing on the platform. And here is what it looked like this week, when I stood by the car. You can see that there is a bit more open water on the river. We live in the woods and have a such a shady yard that the snow melts very slowly. It really seems that our yard is one of the last in town to emerge from winter. After living here for thirty-four years, we are used to it. Nevertheless, each spring we impatiently wait for the snow to go. Here is our yard today, March 19. I’ve decided to use Clif as a reference point next to the snow, and Clare Pooley, a blogging friend, has dubbed him “snow-gauge Clif.” Perfect! 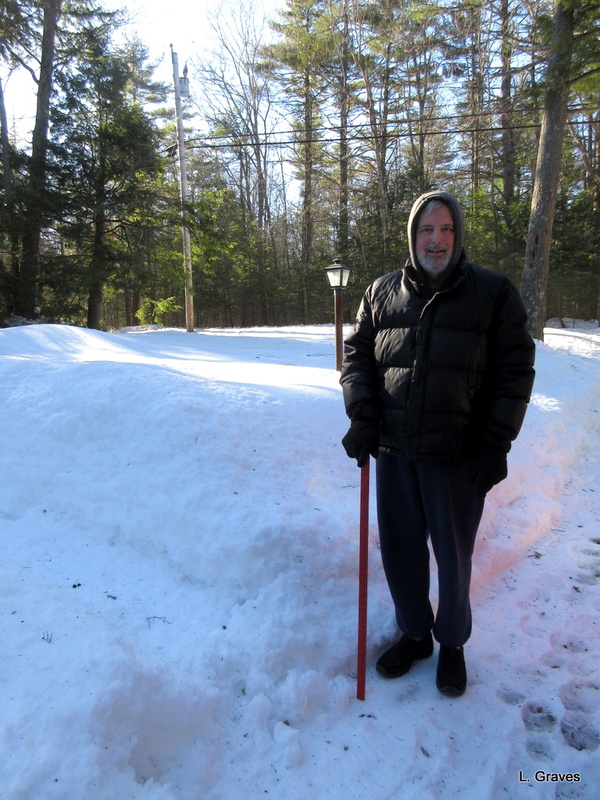 Snow-gauge Clif and his red yardstick will be making regular Monday appearances on the blog until the snow is melted. Here he is today. Sure looks like we live in the frozen north, doesn’t it? No surprise, as Maine is north of north for most people in the United States. 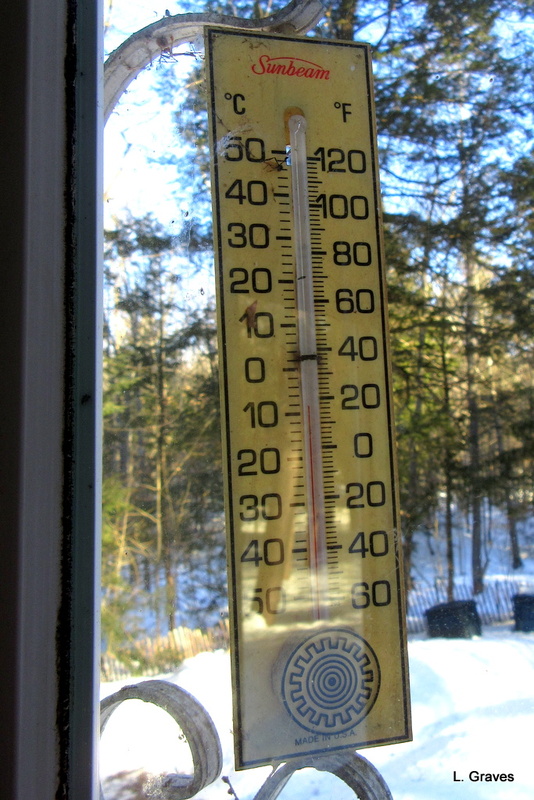 And here was the temperature this morning. There was a brisk breeze, making it even chillier. Hard to believe that two weeks ago, we were eating ice cream outside at Fielder’s Choice. I do believe that day was the warmest of the month. Today also happens to be a special day for us. It is our forty-first wedding anniversary. Why in the heck we decided to get married in March is something I’ll never be able to figure out, but we did. And, I must say that it perks up this dismal month. To celebrate we are heading to Bath, Maine, a small city about an hour from us. 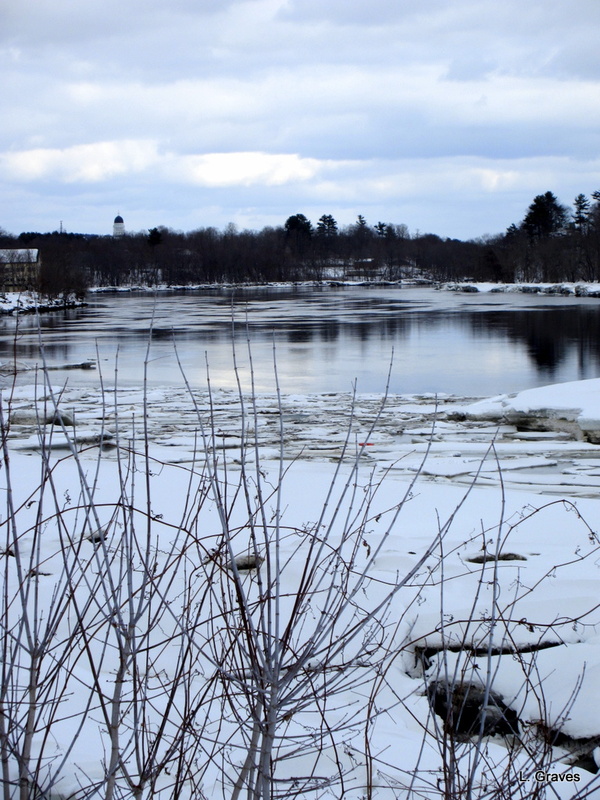 Bath is on the Kennebec River and not far from the Atlantic Ocean. I’ll be posting pictures tomorrow. Happy Anniversary and may the snow go quickly. Thanks, Susan. Snow-gauge Clif will be measuring the progress. Happy 41st anniversary, Laurie and Cliff, and many more to come! I have finally caught up again. You have had more than your share of snow this winter! We got some in February, but all is green here again, and some of the earlier ornamental trees in the area have started to bloom. Our plums and pears should be coming along soon, followed by the apples. I love the photos of Ms. Watson, Sherlock and Gideon you posted a while back. Thanks, Lavinia! My gosh it’s been a volatile March. Massachusetts got hit harder than we did, but there has been plenty of cleaning to do after each storm, and the last one was a doozy with wet, heavy snow. Those flowering trees must be beautiful. And such tasty fruit in the fall. Happy Anniversary on this chilly, yet sunny(!) day – it sure looks cold, the way Clif is bundled up! Thanks, Eliza. A very chilly day. But such a beauty. Happy anniversary. Keep warm somehow. Happy anniversary to you both! Keep warm with your snow gauge! Enjoy your anniversary celebrations! Congratulations on 41 years together. 🙂 What a cold day and such a lot of snow! Thanks, Clare. We had a wonderful day. After we got back, I took the dog for a short walk, and while I’m ready for spring, there’s a part of me that will miss winter. Love the smell of the cold and the stillness that winter brings. I can well understand that. We don’t get enough cold and snow for my liking. We used to get more than we do now. Is there anyway you could turn the heat up before we head back? 🙂 Happy, happy anniversary and many more. I’ll give it my best shot! Safe travels. We did! Thanks so much. 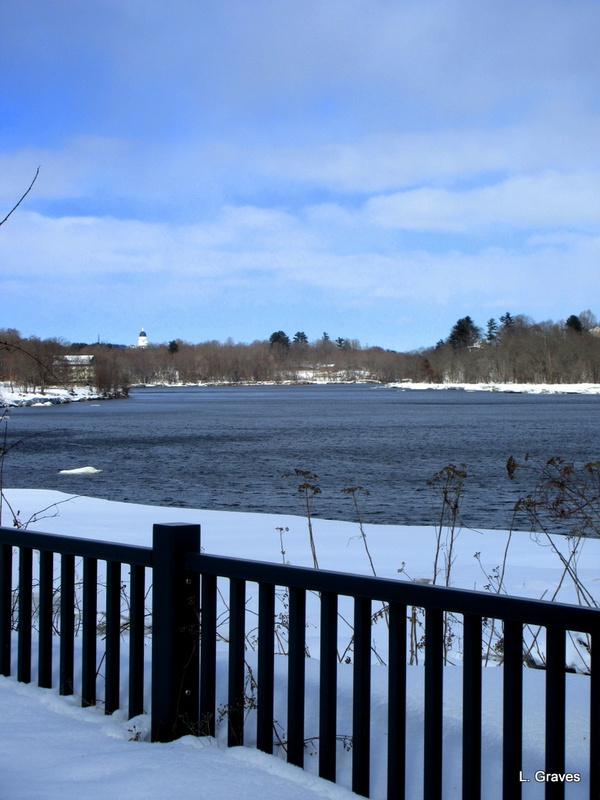 Very brisk still in Maine, but I do love the smell of the cold. The latest storm is supposed to just brush us with about five inches of snow. Fingers and toes crossed! Happy anniversary to you both! Larry and I were married March 26th 1971. We had to step over snow banks to go into the church. Thanks, Sandra. We had such a good day. I am so over winter! But it has to end soon, right? Happy anniversary to you and the snow gauge! There’s a very, very fine yarn shop in Bath . . . Happy Anniversary. You also perk up March for everyone else. Here’s to spring and a speedy snow melt. Clare came up with a good one. Twelve inches? So discouraging! I wonder how much we will get here. I am so unbelievably behind on my reading! Happy, happy belated anniversary! So wonderful!